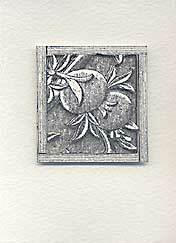 Here's a gallery of cards made with rubber stamps. Hopefully these will give you some ideas on how to use your rubber stamps to make greeting cards and inspire you to include rubber stamping in your card making. Cards Made With Hero Arts Rubber Stamps. 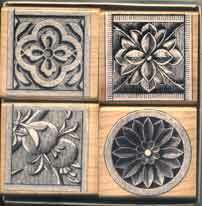 These are done from using the Poetic Prints Rubber Stamps, a rubber stamps set consisting of 4 Stone Etchings rubber stamps. Stone Etchings is one of the many series of rubber stamps in the Poetic Prints Rubber Stamps category manufactured by Hero Arts Rubber Stamps, Inc. Below is a scan of the Hero Arts rubber stamps set used for the following greeting cards I made. 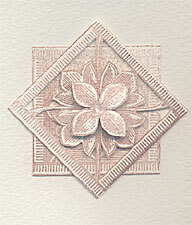 Ink rubber stamp with brown dye ink and stamp 3 times on a piece of white cardstock. Cut out stamped images (refer to the picture above) and layered over one another on the front of your folded blank card. Use double sided foam tape to attach the stamped images to give a 3D effect. Same thing done with the same rubber stamp except that I used black dye ink here. Black dye ink on earth tone cardstock. Only stamped images here. The top layer is quite delicate and has to be careful when cutting the inside of the image. Variation: You can also use a transparency just below the top layer and put some confetti or micro beads inside the compartment to make a shaker card. Make sure that you seal up the four sides with double sided foam tape leaving no gap in between. Tip: Cut the inside of the image first before cutting the whole image from the piece of cardstock. Check out the following page for other card making techniques and ideas. Same idea as the above card. 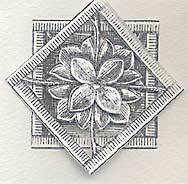 Now try using the same technique on other rubber stamps.